By the time you are reading this corner, the holiday season must already be in full swing– Christmas decorations are up, get-togethers and reunions planned and carols are played. As joyous sights and sounds are everywhere, colorful series lights, lanterns made of indigenous materials, a house with Santa Claus collections and a giant Christmas tree are some of the main attractions for the Christmas season in the province. 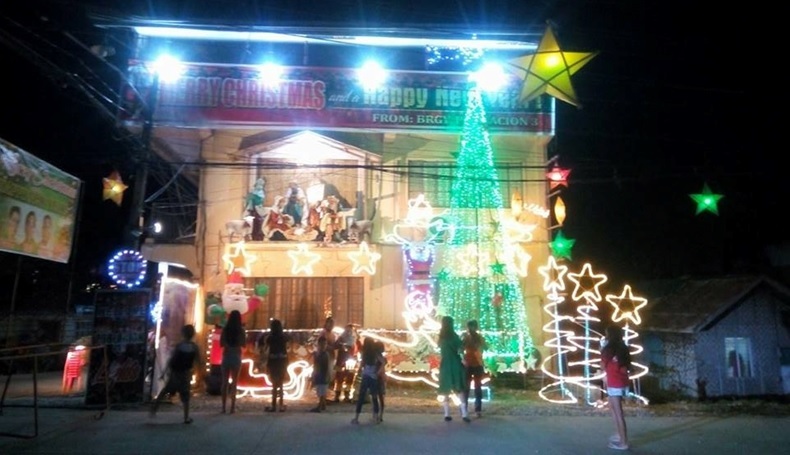 For businesswoman Hermila “Mila” Lim, she started decorating her home on M. Torralba Street in Tagbilaran City with Christmas decorations as early as September. Fascinated by St. Nicolas since childhood, Mila has adorned her house with a vast collection of Santa Claus memorabilia, ranging from life-sized, singing and dancing Santas to Santa theme plates and mugs, candles, toys, dolls and figurines. Upon entering, a visitor immediately hears the song, “Deck the Halls,” and sees a garden decorated with small and life-size snowman figures. Inside her house, more Santa Claus images of different shades and shapes and other quirky Christmas items collected for the past 17 years are displayed. There are drunk Santa, a photographer Santa, a dancing Santa, a Santa Claus band, Santa in a parachute, singing and dancing Santas with reindeer and even a Tarzan Santa. There are Santas at the doorsteps and all over inside the place. Her dining table is complete with Christmas inspired drinking glasses, place, placemats and utensils. The Santa Clauses and other Christmas decorations were acquired during Mila’s travels with her husband Teofilo to Cebu, Manila, Israel, Australia, Hong Kong and China. Mila and Teofilo own one of the biggest liquified petroleum gas (LPG) dealership firms in Tagbilaran City. In 2008, Mila began her Christmas Village project. 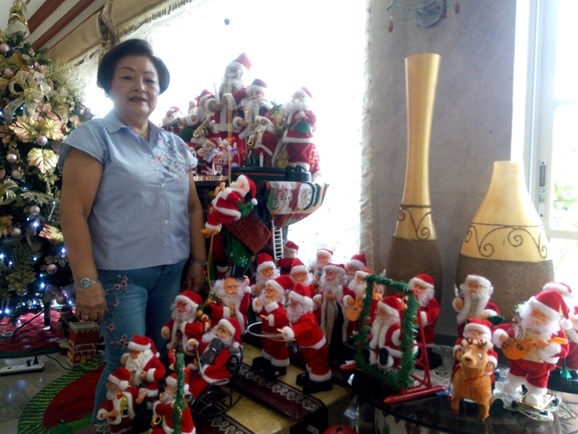 Her collection of miniature Christmas houses and objects has grown since that it captured the attention of GMA News to feature her collection. 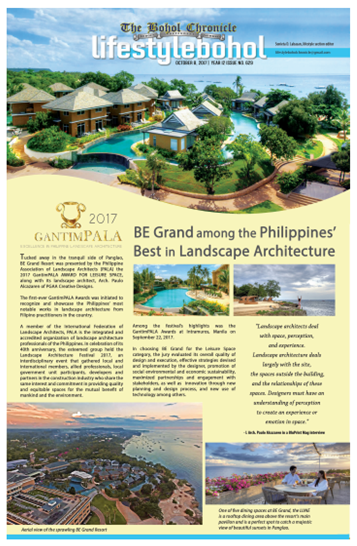 However, some of her miniature collections were broken during the Oct. 15, 2013 earthquake that brought Bohol to its knees. For personal reasons, she stopped putting up her Christmas Village since 2016. Instead, Mila has filled the house with Santa Claus. “I love Santa Claus,” she says. “It gives me joy,” she adds. To date, her collection has 350 Santa Clauses. The spirit of the season is ever so felt by residents of Poblacion 3 in Tagbilaran City as parols (lanterns) of different colors are hanging along the busy street. The traditional parol is a five point star-shaped Christmas lantern which has been a time-honoured Christmas symbol in the Philippines. Follow the parols and it would lead you to the Barangay Hall of Poblacion 3. “The Christmas parol is a reminder of the star of Bethlehem. It symbolizes the guiding light of the Three Wise Men to the manger of the Child Jesus,” says the workaholic Pob. 3 councilor Leo Cinco. The Barangay Hall of Poblacion 3 has been wrapped with holiday decors. Last Friday, village chief Ody Glovasa led barangay officials in the ceremonial lighting of Christmas decorations at Poblacion 3 Barangay Hall to formally welcome Christmas 2017. This year’s decorations include a giant Christmas tree, Santa Claus and his sleigh and a giant belen (manger) featuring the nativity scene. “We are doing this every year, but we want it more colorful this year,” says Cinco. A few meters from Poblacion 3, as beams of lights illuminate the St. Joseph the Worker Parish Cathedral, which attracts attention, parishioners can see the 30-feet high Christmas tree beside the church. The giant tree, which is adorned with parols and small baskets, uses light-emitting diodes (LEDs). At the top of the Christmas tree is a cross which reminds the parishioners the true meaning of Christmas. Lilian Foronda, 12, likes to stroll around the church’s “rotonda” to see the Christmas tree. “Ganahan ko sa Christmas tree diri sa simbahan kay nindot (I like the Christmas tree here because it’s nice),” says Lilian. In Baclayon town, parols with different colors literally lit the highway. Just follow the parols and it would guide you to a biggest star at the top of a belen (manger) in Barangay Santa Cruz. The belen is made of indigenous materials. The figures representing Joseph and Mary, the child Jesus and the three kings measuring about four feet in height, and the sheep are made from coconut husks, fibers, beads and shells. Villagers said they utilized materials out of coconut in keeping with up the government’s environmental campaign and the use of recyclable materials. The “Belen” as this year’s theme is to remind everyone about the real meaning of the yuletide celebration. Christmas is the most exciting time of the year. VRS wants to hear and see your best, most spectacular story and images of Christmas where you live. What is Christmas like for you? What do your decorations or lights look like this year? What holiday traditions do you celebrate? Will you be attending particular Christmas events such as Simbang Gabi? If you do not celebrate Christmas, how will you spend the holidays? Send your story and favorite images of your Christmas celebrations to leoudtohan@yahoo.com for a chance to be featured in VRS.